One shouldn't be afraid of mutations, at least beautiful ones. When we take the speed, acceleration and diversity of our 29er hardtail geometry and "Splice" it with the efficiencies of our commuter expertise, we arrive at an evolutionary creation bestowed with grace, finesse and a dash of, dare we say, toughness. With the same geometry as our legendary Kahuna, but with an 80mm fork and components designed to spin everything from backroads to backcountry, the Splice is best described as a cross between a Kahuna and a Dew. Designed for those who like to balance a real smooth ride with real good value. Light, very manoeuverable. very economic 29er. decent to good components. Mech brakes are worry free at -20C temps. I like very much. This is NOT a competition bike. It is a very good tough commuter capable of non-maniac roughish trail riding (eg rounded cobble size stone gently handled). It is a heavier duty hybrid with decent components for what it is good at. Shocks are light duty (they even say so on the barrels (amazing honesty) so don't think to don't go screaming on single track. ), Brakes are Promax - light duty (small caliper block, small pads, low temp) but very serviceable. 160mm disks front & back, NBD. Don't go screaming downhill for the whole trip. Bought 2nd hand after my Trek Xcal 5 hardtail was stolen from outside my coffee shop. Ride it 4seasons in Calgary with studs on 2nd wheel set as needed. Hybrid frame barely takes 2.25" Schwalbe 29" Ice Spikers when new but they do fit with a little wiggling past the derailer and seat stays. Not a lot of snow/slush clearance but NBD. Be adaptable and make derailer & BB slush/grit screens . Seat-tube derailer cable fairlead/bracket is angled and can cause wear on cable with extreme high use on bottom pull derailers but very common feature. Buy again in a heartbeat, especially used. This thing goes up hills with ease. It's a pretty light bike and very smooth ride. the seat is pretty uncomfortable but that's a very easy fix ???? 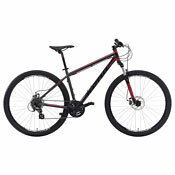 Great entry level MTB bike that also is great for riding around town. It's the only bike I need. Its a high end recreational bike. The frame and its relaxed riding position thanks to frame geometry. The forks are good at this price range. Its a 29er with 29 inch wheels. For off-roading the saddle isn't comfy enough. The handle bar grips are uncomfortable without gloves. Before I review the bike let me first point out that bigger wheels are the way forward. In the future adults won't buy 26ers because 29ers and 27.5 inch wheels will be the norm. Right now the manufactures accept the popularity of 29ers and the wider manufacturing support has brought down the price. Sadly this has yet to happen with 27.5 inch wheels but it will in the next few years. 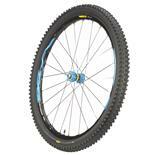 29ers are best for cross-country riding (XC) whereas the 27.5 inch wheels are the future of downhill. The two wheel sizes are closely matched on trails. Kona is a respected brand that has been around since the beginning. The frame is what most matters on a new bike and that is where Kona has invested most, but be aware of this frame's geometry. It has a upright riding position thanks to the high front-end and the short reach to the handlebars. This upside means you can ride without straining your back, neck and shoulder muscles. The flip-side being slightly more rider weight is placed on the saddle. 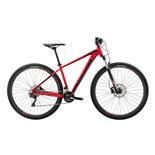 Kona describe this bike as recreational which it is, but where it really matters it's top-end recreational bike. - The forks are Suntour XCR front suspension which are the best of their budget types (followed by XCM then XCT). Don't let the 80mm of travel put you off; other bikes offer 100mm but on worst forks and on my rides so far these haven't bottomed out on me. The disc brakes are cable operated which don't feel as good as hydraulic ones but they work well and can be upgraded to these at a later date easier than wheel rim brakes. The drive train components are OK. In my opinion the higher number of gears are more important than the components and at this price you won't find a better 29er bike with 24 gears. The pedals also are OK but some people might want more grip. Finally going back to the riding positions, the saddle is wide enough and comfortable on-road but not off-road. Along with getting some gloves this will be my first upgrade for more off-road riding. The two options here are either a comfy gel saddle replacement, or a suspension seat-post such as the Cane Creek Thudbuster. Get the right bike for you. Be honest about the riding you see yourself actually doing. Value 4 out of five because you get a nice frame and I paid less than 500€ as it was last years model. 3 overall because the frame is almost the only thing thats right about this bike. I got this bike for winter commuting to school. Well you know what then happens when you start reading mtb forums and such.. I really like my Band Wagon so Kona was an easy choise. I test rode Unit but found it too expensive for my student budget. This in the otherhand was just under 500€ and I thougt that IF I build it to a deacent mtb I'd have a good frame to start with. Now that I've changed stem, steel fork, cranks, hydraulic brakes, and made it dingle-speed, I love it. But hear me as I say, it really NEEDED those changes, 'cause riding in the woods with bike that has bad parts isn't fun. Great ride position, fast and smooth. I use the splice as a commuter around 14 miles round trip up hill and down dale, it was perfect for my budget and having owned an old Lava Dome I went for the brand i knew. Although the drivetrain is not great it hasn't skipped a beat thus far, I had to remove the crank to tighten the bb but that wasn't difficult with the correct tools, the mechanical disks work as they should and i find them easy to adjust, saddles nearly broke in and works fine the pedals are a little weak so wouls swap them out when you're ready, but most importantly get rid of yhe p*** poor tyres, had so many flats that i have slung them into some poor farmers field. I have put schwalbe marathons on and up to now no more flats wahey!! Been years since I rode a mountain bike and thought I would get back to into it by buying an entry level bike. I found the Kona Splice at my LBS and I couldn't pass up the deal that was offered to me. I ride roughly 2-3 moderately difficult singletrack miles a day and 12 of the same miles on the weekend. Just like anything, you get what you pay for. I enjoy how light it is for being 100% stock from the LBS floor, the frame is great in esthetics and function, the tires wear well and grab decently, the front brake works like a brake should, and the rims are holding their own. It shifts effortlessly and the granny gear is a real granny gear. The front shock is an 80mm Suntour where the average elsewhere is 100mm. I'm not the smallest guy on a bike, 6'0" 270 and I have a tendency to break thinks that aren't meant to be broken. The front shock is lockout capable and its very handy. It also has an adjustable preload like most other shocks. I've run into 2 instances where my forward momentum has been stopped dead and my front shock compress all the way. After that happening it appears to have lost all its preload, and the preload knob spins with ease and can't be adjusted for a heavier rider. I dont have a problem with linear disc brakes, yet, but it's taking a lot more energy and pull to get the rear brake to grab where it slows me down. The seat is a little rough on the taint, kind of like going 10 rounds with Tyson. The budget conscious beginner just getting into bike riding or the guy who hasn't been riding in a awhile should purchase this bike. If you have the extra money I would purchase the model just up from this, I believe it's the Mahuna. As soon as I took this out and let it eat up potholes like they were cupcakes I was convinced. Super comfortable geometry thats suited for the work commute or hitting the trail for hours at a time. I have the tires it came with for off roading and then swap them out for 700c x 40 tires for the city. Super versatile bike. My favorite is the top speed this bike can reach, it's intense . The brakes and possibly the saddle. They cheaped out on the mechanical disc brakes. They are finicky as hell. I have since gotten use to the saddle but I believe most would probably like to upgrade. If you want to feel like Godzilla with your power to crush the city underneath your giant wheels, this bike is for you. Did I mention you can get it for 650$? Great price for an amazingly fun comfortable ride. 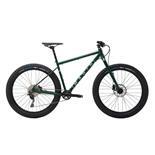 great frame geometry, very comfortable to ride whether you are bumping along on fire roads with the shock locked out or climbing and weaving on single track. Good stand over height to get behind the seat for the down hills. This comes with mechanical brakes whitch i still prefer over hydralics, just a preferance. The Kona site says this comes with a wtb saddle but thats wrong. It comes with a Velo saddle, which is embossed with the kona 29er trademark. So its worth swapping it out just to keep the saddle nice. I did put a WTB Speed V on it. The pedals should also be swapped. It comes with basic wellgo platforms, i prefer platform pedals with the steel studs like the Wellgo WAM-B25. Over all very minor changes. This is an excellent Hardtail 29er for under $700. I definitely any one wanting to make the swap to the bigger wheel of the 29er with out spending a ton. 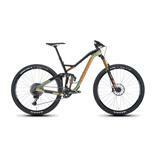 It is a hardtail so any one that wants to have a super smooth right will still want a FS. The bike is still a hog but lighter than either of my other 2 hardtails. I dont race so the components are good for me, the weekender that likes to hit the trail. The Sales staff at Little Ades really know what they are talking about and were extremely helpful with helping me decide between the Kona Splice and the Kona Mahuna and the Specialized Rock Hopper.